Written by Jeffrey Dach, M.D. Mary is a 57 year old female with chronic fatigue, dry, brittle hair, dry skin, muscle aches and pains, and depression, all obvious symptoms of a low thyroid condition. Mary has been to a number of endocrinologists, primary care doctors and even sought advice from her hair stylist for her frighteningly thinning hair. Her latest doctor prescribed a thyroid pill called Levothyroxine (50 mcg) which has done little to relieve her symptoms. In addition, she has depression, and her psychiatrist prescribed an SSRI antidepressant, called Zuloft. She also takes Xanax for bouts of anxiety and insomnia. Mary came into the office frustrated with her conventional medical treatment which was not helping her. Mary was switched from Levothyroxine to Nature-throid and within a week reported improvement in clinical symptoms. Six weeks after Mary’s Nature-throid dosage was gradually increased to two and a half tablets every day (using one grain tablets of 65 mg each), Mary reports improvement. She has tapered off her antidepressants, as she no longer needs them. Ten weeks later, Mary goes to see her OB/GYN doctor for her annual pap smear and pelvic exam which included a TSH blood test, with a low result (0.1 which is below the TSH reference range). Her OB/GYN doctor looks at the TSH test result and tells Mary she is taking too much thyroid medicine and needs to cut back. Mary then calls me at my office to relay this information. Two doctors are telling her different things and Mary doesn’t know who to believe. This scenario plays out in my office with a different patient each week. The treatment of the low thyroid condition with natural thyroid is superior to Levothyroxine (a T4 only medication). In our office we use Nature-throid from RLC labs. (Disclosure: NONE, I have no financial relationship with RLC labs, the manufacturer of Nature-Throid NDT – natural dessicated thyroid pills). Natural Thyroid which contains both T3 and T4 is a more robust and safer thyroid medication when compared to T4 only medications such as levothyroxine and Synthroid. This is my assessment, based on 10 years of clinical experience prescribing Nature-throid. In addition, we have found that patients who have converted from Synthroid to Natural Thyroid are much happier with their treatment program. The mainstream medical literature is also in agreement. The TSH test is not a reliable indicator of adequacy of treatment. (2) When the patient is taking the proper dosage of natural thyroid medication with complete relief of symptoms, the TSH will typically fall below the lab reference range, also called a suppressed TSH. In other words, the TSH will be quite low, and this will disturb the mainstream clinician who mistakenly believes the patient is taking too much thyroid medication. The issue can be settled simply by running a Free T3 test which will show that the Free T3 is in the normal range, thus excluding any possibility of a “hyperthyroid state”. Unfortunately, most conventional docs do not have the knowledge to order a free T3 test, and have limited understanding of the thyroid patient. Again, knowledgeable physicians are finding that TSH suppression below the lab reference range is required for adequate treatment of the low thyroid condition. In this Kuma Hospital study, they found that TSH-suppressive doses of Synthroid were needed in post thyroidectomy patients to achieve the same normal Serum T3 levels which were present on pre-op labs. When Natural thyroid medication is used, and the dosage gradually adjusted upwards from 1/2 tab daily to the maintainance dose of about two to three of the One Grain (65mg) Tabs daily (the ideal dose for each person is highly individual) usually done over 6 weeks, the lab panel at this time will typically show a TSH which is below the normal reference range, and a free T3 which is in the upper end of the normal range 350-420. 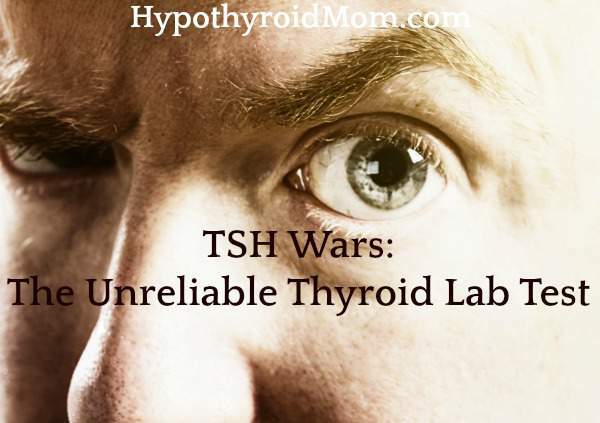 The low TSH is to be expected, is not disturbing, and is not indicative of a hyperthyroid state. Dr. Jeffrey Dach is the founder and Medical Director of a clinic in Davie, Florida specializing in bioidentical hormones, natural thyroid, and natural medicine.Dr. Dach is Specialty Board Certified in Diagnostic and Interventional Radiology. Dr. Dach is a member of the American Academy of Anti-Aging Medicine, as well as the American Academy for the Advancement of Medicine. 2) TSH may not be a good marker for adequate thyroid hormone replacement therapy. Wien Klin Wochenschr. 2005 Sep;117(18):636-40. Alevizaki M, Mantzou E, Cimponeriu AT, Alevizaki CC, Koutras DA. Endocrine Unit, Dept Medical Therapeutics, Alexandra Hospital, Athens University School of Medicine, Athens, Greece. 4) Thyroid hormone replacement: an iatrogenic problem. Int J Clin Pract. 2010 Jun;64(7):991-4. Dr O’Reilly DS. Department of Clinical Biochemistry, Royal Infirmary, Glasgow, UK. 7) Thyroid. 2000 Dec;10(12):1107-11. Is excessive weight gain after ablative treatment of hyperthyroidism due to inadequate thyroid hormone therapy? Tigas S, Idiculla J, Beckett G, Toft A. Source Endocrine Unit, Royal Infirmary, Edinburgh, Scotland. 8) BMJ. 2003 February 8; 326(7384): 311–312. PMCID: PMC143526 full text free. Serum thyroid stimulating hormone in assessment of severity of tissue hypothyroidism in patients with overt primary thyroid failure: cross sectional survey. 9) EJE. 2012 September 1; 167: 373-378. TSH-suppressive doses of levothyroxine are required to achieve preoperative native serum triiodothyronine levels in patients who have undergone total thyroidectomy. 10) Eur Thyroid J. 2012;1:88-98. Thyroid Hormone Replacement Therapy: Three ‘Simple’ Questions, Complex Answers. 11) J Clin Endocrinol Metab. 2012 Jul;97(7):2256-71. doi: 10.1210/jc.2011-3399. Epub 2012 May 16. Combination treatment with T4 and T3: toward personalized replacement therapy in hypothyroidism? 12) Eur J Endocrinol. 2012 November EJE-12-0819. Is Pituitary Thyrotropin an Adequate Measure Of Thyroid Hormone-Controlled Homeostasis During Thyroxine Treatment? 13) Arch Intern Med. 2008 April 28;168(8):855-860. Thyrotropin levels and risk of fatal coronary heart disease: the HUNT study. I had a high Reading for the thyroid and the doctor raised my Levothrozine to 200mg. Three months later my Reading was .01 . The report indicated that it wad lower. I figured the doctor would lower my dose of medicine, but her nurse called and said the low reading indicated the thyroid was working ok and it was ok. My sister has had thyroid issues for thirty years and she is very knowledgeable about it. She said I should lower my dose of Levothrozine because that low and I keep taking the same meds could be dangerous. Should I call the doctor back or just skip a dose each day of meds??? I know this is a bit old of a post, but I found stopthethyroidmadness.com’s article on reverse t3 interpretation really helpful.